Tsar Nicoulai Caviar will be closing its cafe and vacating its storefront. It appears not even the elite are immune from the economy. 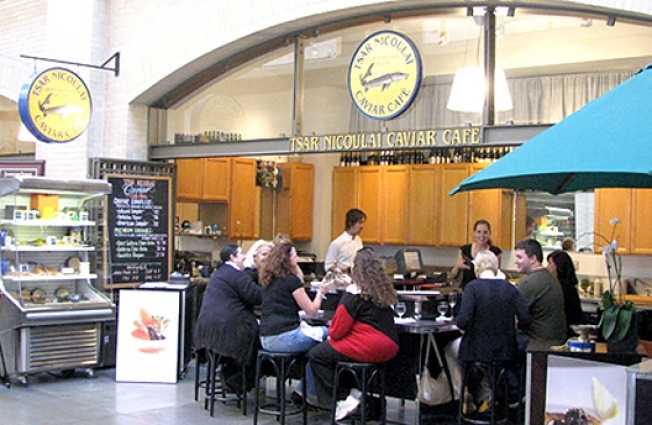 Downtown San Francisco caviar lovers will have to find a new place to get their fix of salted roe because Tsar Nicoulai Caviar will be closing its cafe and vacating its highly desirable storefront in the Ferry Building. The caviar company will shutter its Ferry Building outpost sometime in mid-January. But all is not lost for fans of Tsar Nicoulai Caviar. The caviar sellers plan to eventually reopen in a bigger space, possibly in the Union Square area. While racing from the Embarcadero to the Union Square area for lunch may not be viable, it can't be too much cheaper to operate there than the Ferry Building. It is probably a lot easier to find larger space though. There's no word yet on what will be moving in to the Ferry Building spot, which is between Miette and Scharffen Berger (across from Golden Gate Meat), but do share your suggestions in the comments. And potential restaurateurs, get those bids ready.